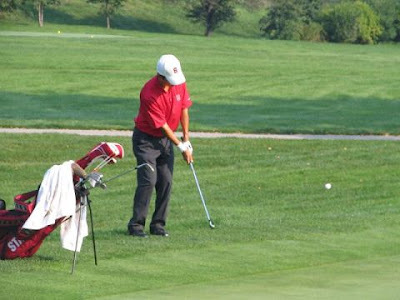 Freshman David Chung, after a steller junior career, writes about his first college tournament experience playing in the Illini Invitational at Olympia Fields. "My first tournament was a great experience. It started when we met at the golf course parking lot to head to the airport. Those that weren’t traveling showed up to send us off and those of us that were traveling suited up in our blue blazers and Stanford ties, gathered our bags, and drove off. The plane ride to Chicago went smoothly and we checked into a nearby hotel for some rest. The next day played at Chicago Golf Club for a fun round. Chicago Golf Club is one of those clubs that is so exclusive that it is only recognizable from the road by a computer screen sized metal plate that simply states CHICAGO GOLF CLUB and is listed on a GPS navigation system not as Golf Club Drive or Masters Lane as some are golf clubs are; instead, the GPS voice tells you to turn into alley to get to Chicago Golf Club. We were lucky enough to get invited because Mr. Grube, the father of former Stanford golfer Rob Grube, is a member and was generous enough to invite us to his club for a day of golf and dinner. The course was very difficult but also very enjoyable to play. I had the privilege of playing with Mr. Kinsey, Mr. Gifford, Coach Ray and Coach Tight. Coach Ray and I had a fun match which luckily I was able to win. Following a great time at Chicago Golf Club we drove to a hotel closer to Olympia Fields – where our tournament would be played. The next day I got my first look at the course. Olympia Fields is a course that challenges and tests every aspect of a golfer’s game. It had 7 inch tall rough, narrow fairways, fast undulating greens, and plenty of length. Friday we started the Fighting Illini Invitational and I got to play my first college round. I got off to a solid opening hole and felt excited and ready to help our team win, but on the second hole after a great drive, my approach shot caromed off the side of a bunker and under a tree root. That unfortunate break would lead to a quadruple bogey and a giant hole for me to come back out of. I would finish the round with very average play and shoot 79. I was very disappointed with my first round but quickly looked for ways to contribute as our team focused on round two. In round two, Coach Ray followed me and was basically my caddie. It was very helpful to have his input on every shot and also enjoyable to have him by my side. Round two would bring some solid play and more confidence in my driver, but a triple bogey on the 16th hole killed me and led to a 75. The final round our team was pumped up and ready to finish strong. I was determined to help out our team score and have a good round. I played very solid golf and shot what seemed to me like an easy round of 71. Our team also played solid on the final day and shot a respectable 4-over total for a total of 27 over and 4th place. We were all disappointed that we didn’t win but we all learned a lot about ourselves, our games, and each other. I feel that we’ve grown a lot as a team already and I’m excited to make 2008-2009 a great season!" Here's David with a touchy downhill chip on 8 at Olympia Fields GC. It ran 4 feet past and left of the hole and he made the par putt.